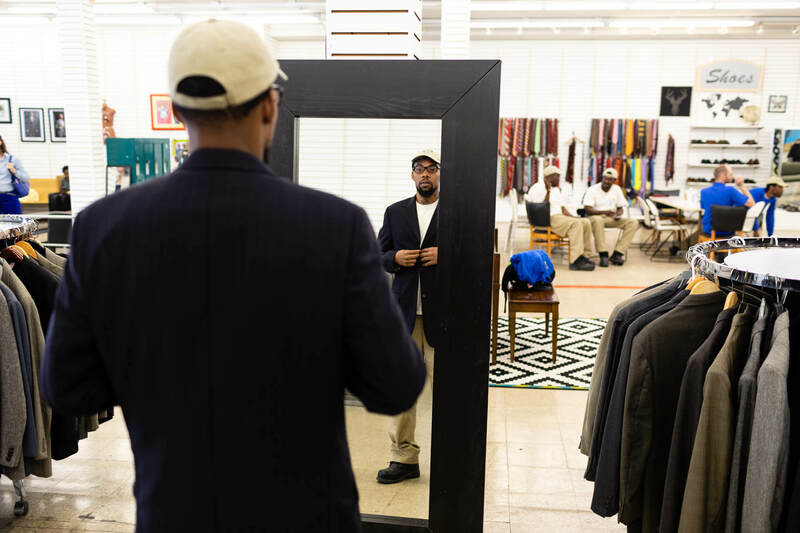 Dontae Carmichael, 27, tries on a suit at Sharped Dress Man in Baltimore. The Work2Live WELL program took a field trip to the nonprofit, which outfits men with donated suits to aid in professional advancement. Dedric Greennagh, 43, stretches while working on cover letters at Civic Works in Baltimore. Greenagh said he hopes the eight-week training will lead to "not just a job—a career." Charles Partlow, 39, unbuckles his helmet after climbing a tree for the first time at Patapsco Valley State Park in Carroll County, Md. "Somebody’s got to be a leader, man." Trainees watch another member of the Work2Live WELL program scale a tree at Patapsco Valley State Park in Carroll County, Md. Trainees completed instruction and frequent field trips. Antwan Watson, 30, at Civic Works. "I did a little landscaping—but it was just for the money," Watson said. 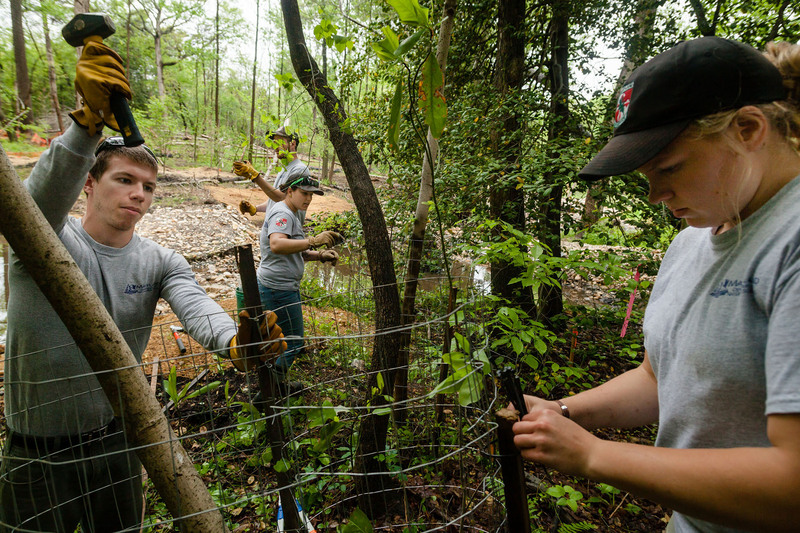 "Being in this program...made me care about the wildlife and species and fishing and stuff like that." 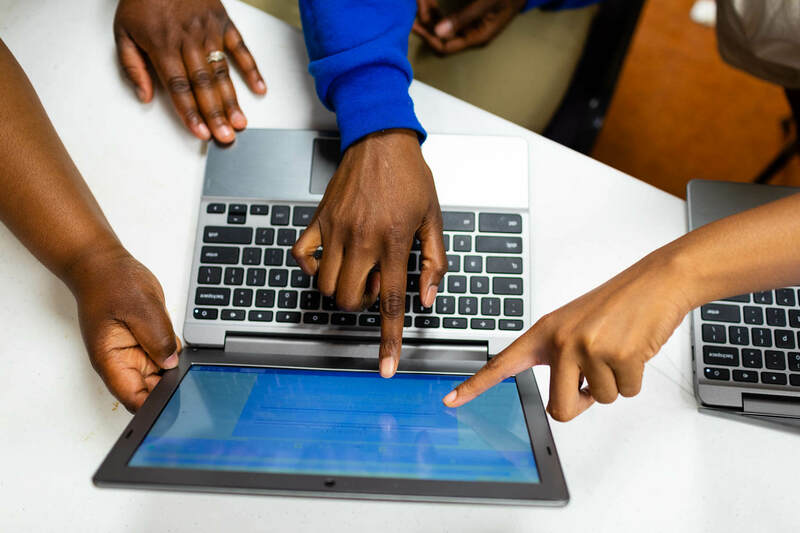 Trainees work on job applications using laptops provided by Civic Works in Baltimore. 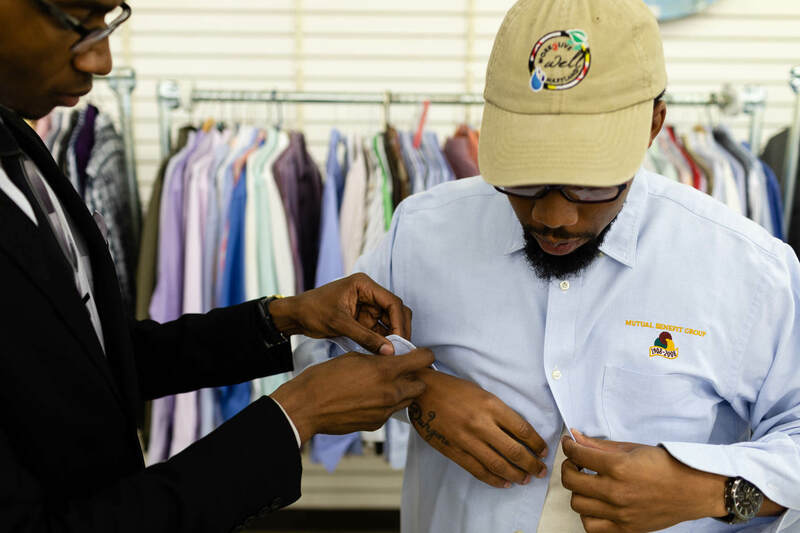 Dontae Carmichael, 27, tries on a suit with help from Christopher Dews, training coordinator at Civic Works' Baltimore Center for Green Careers, at Sharped Dress Man in Baltimore. 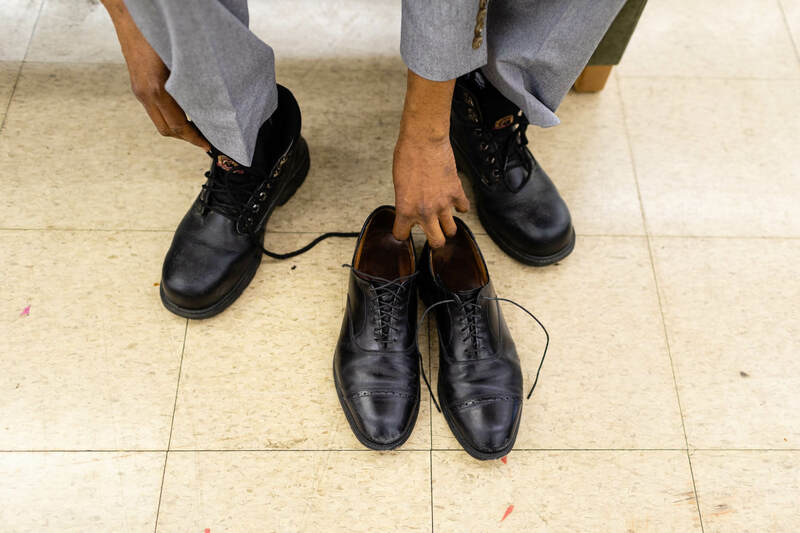 Ron Blackwell, 36, trades his work boots for dress shoes at Sharped Dress Man in Baltimore. On a drizzly May day at Patapsco Valley State Park in Carroll County, Maryland, about a dozen adults in matching blue sweatshirts and thick work boots gathered around a sturdy chestnut oak to watch a pair of arborists loop a rope around a branch about 20 feet off the ground. After a short lesson, one by one, the group started to climb. 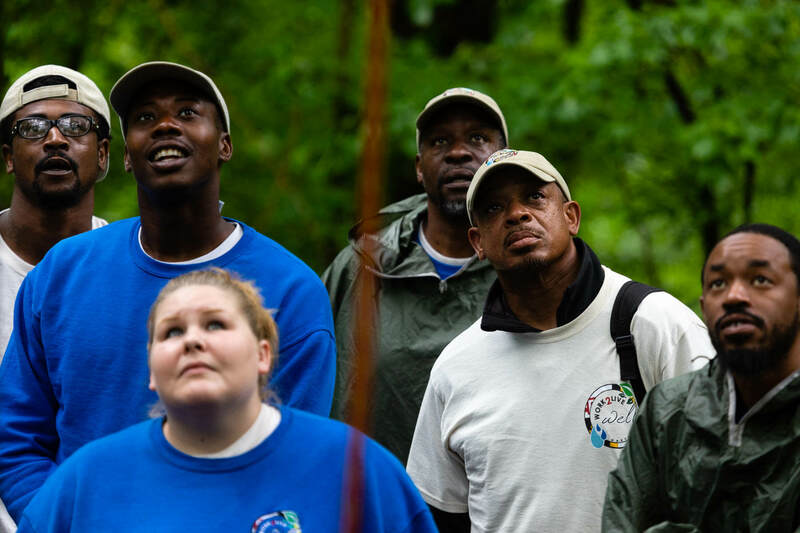 The park served as a classroom for the final field trip of the Maryland Department of Natural Resource’s (DNR) Work2Live WELL program,. The inaugural program, in partnership with Baltimore Civic Works and other public and private partners, provided eight weeks of labor intensive, hands-on training to 16 participants in Baltimore and two in Cambridge, in order to prepare them for careers related to sustainability and the environment. Work2Live WELL, which is funded by the Maryland Department of Labor, Licensing and Regulation's (DLLR) EARN Maryland program, is one of many green jobs training programs serving a demand for workers that is only expected to increase as regions of the Chesapeake watershed focus on meeting their restoration goals, and as industries respond to growth in fields like solar energy and recycling. 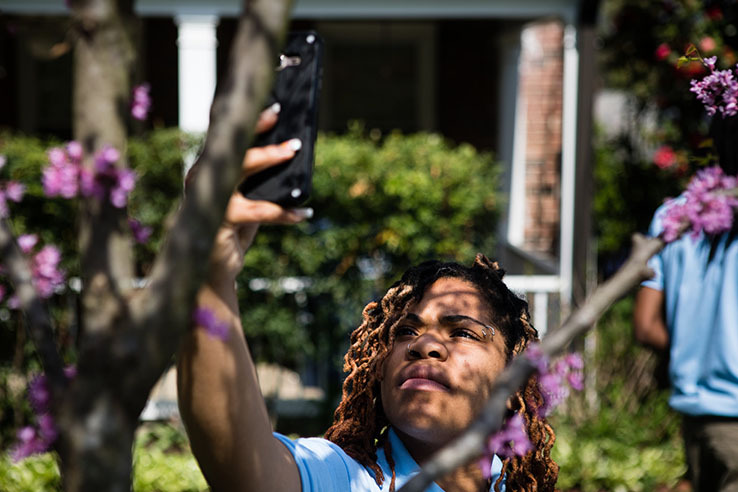 “The number of jobs are growing, so the number of companies are growing because of Maryland’s growing investment in environmental restoration,” said Eli Allen, director of Baltimore Civic Works’ Baltimore Center for Green Careers. In Maryland, investment in green sectors is on the rise. The state’s total investment in stormwater projects will top $1 billion within a few years. In Baltimore alone, according to an analysis compiled by Civic Works, investments in environmental remediation of brownfield sites total $2 billion. As of 2017, investments in energy efficiency and energy conservation following the EmPOWER Maryland Act were $2.4 billion. In some cases, growth has led to a shortage of available labor. For example, 87 percent of solar companies in Maryland stated difficulty in finding qualified workers, according to a 2017 report by the Solar Foundation. “Definitely when we started planning [the Work2Live WELL program] we knew that there was a need by the industry for skilled staff,” said Trystan Sill, who manages the program for DNR. Sill said that much of the existing green jobs workforce is planning to retire soon, and she is expecting a wave of job vacancies in coming years. “And unless we have younger or really passionate incomers to green jobs who are able to work alongside these folks that are getting ready to retire, we're going to lose a lot of that knowledge and they're not going to be able to pass it along,” Sill said. The training has also been a chance to make industries more inclusive. 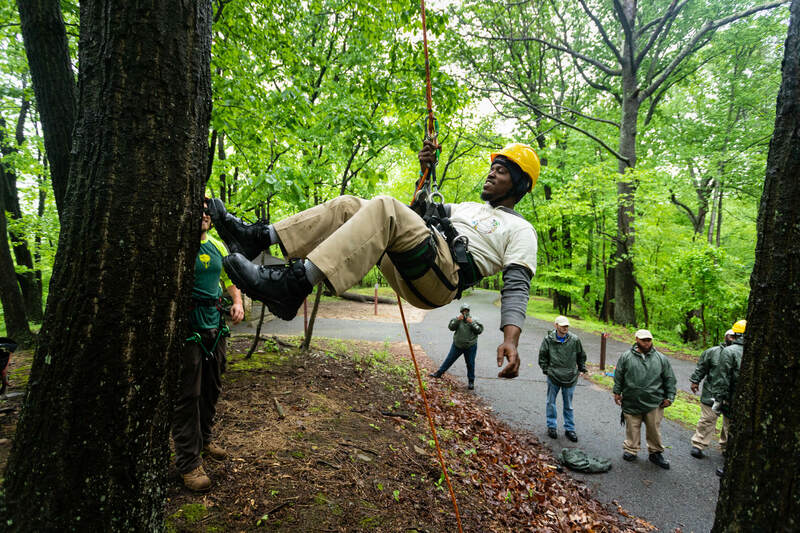 Marian Honeczy, Supervisor of Urban and Community Forestry for the Maryland Forest Service, served as an instructor for eight days of the program, seeing the trainees through everything from tree biology and arboriculture to chainsaws and the climbing. Allen sees a similar opening for industries to be more intentional about their hiring networks. “We think that there's an incredible opportunity with the looming retirement wave to just help the construction sector and the green jobs sector reach this untapped talent pool across Maryland, across the Baltimore region—women, people of color—who have more limited access to these kind of skilled trades and other construction sector positions that pay good wages and have significant opportunities for career advancement,” Allen said. 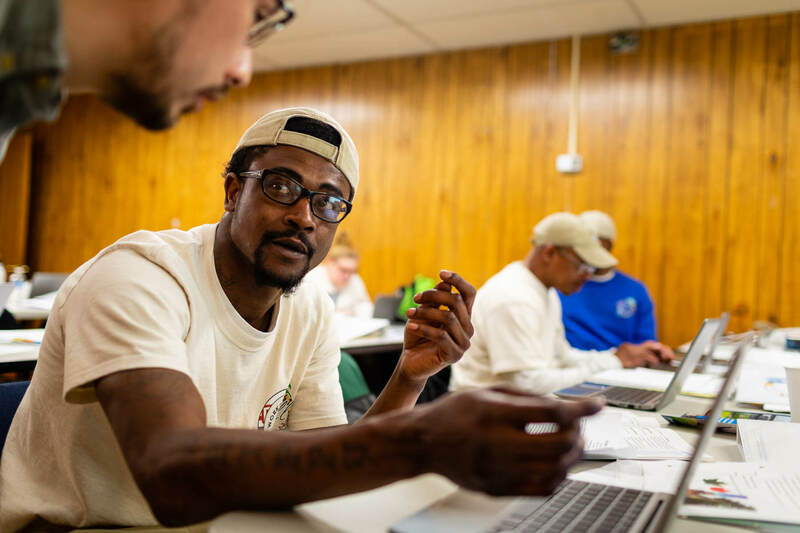 Civic Works provided the classroom portion of the Work2Live WELL training, offering case management to remove obstacles to finding a job, such as securing transportation, child support or health care. The support will continue for the two years following the trainees' graduation. “Resume skills, mediation, conflict resolution—I mean they help you in every area of your life, it seems like,” said 37-year-old trainee Andre Neal. Another trainee, Ron Blackwell, 36, said he wasn’t hirable before starting the eight weeks of training. “I got so much extra stuff done with my life through the other things that [Civic Works was] offering,” Blackwell said. 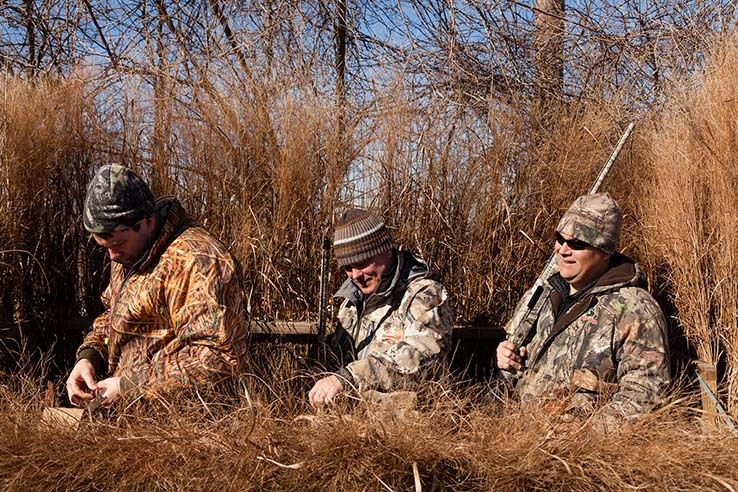 Each trainee received professional assistance from mentors working within natural resources. Most came from within DNR but some were from outside partners like the National Aquarium or Baltimore City Public Works. They were also someone experienced, with whom a trainee could network to find out about job openings. “My mentor said, ‘Well look, I think you can do this. Try.’” Blackwell said. Even before he finished the program, Blackwell said he was offered a job with a lawn care company. Sill said that three months after the end of the training, about two-thirds of the 18 trainees who finished the program were still employed. One day, toward the beginning of the eight-week program, the trainees filled mismatched chairs in Civic Works’ basement. Underneath rows of tables, shiny boots squeaked as instructors helped the group write resumes and cover letters. Falon Jones, 36, leaned in close to one of Civic Works’ laptops, typing into Google Docs. She had found out about the Work2Live WELL program from a friend who was in one of Civic Works’ other jobs trainings. Jones hoped the training would help her begin a career in stormwater management. However, green jobs don’t have to be outdoors. Professions in weatherizing homes and recycling facilities can also be considered green jobs. “Often times people don’t see the range of opportunity in the green jobs and the green economy,” Allen said. And even if they are aware of the jobs available, Sill said, potential applicants might not know that they meet the requirements. After everyone took turns at tree climbing at Patapsco, arborists Paul Mullins and Garrett Dickel of Bartlett Tree Experts led a discussion underneath a patio awning that was a mix of education and a pitch for prospective job applicants. “We don’t have bachelor's degrees and we’re doing just fine,” Dickel said. Neal said he had in fact gotten a diploma from a trade school in electronics, but couldn’t find a job and ended up $15,000 in debt. He had been out of work a year before starting the Work2Live WELL program. “A lot of [employers] don’t want to give you a shot if you’ve been out of work so long,” Neal said.